A white bean salad doesn’t have to be boring. Creamy cannellinis absorb the bright flavor of a vinaigrette in just a few minutes. Paired with briny olives, fresh cucumbers, tomatoes and feta cheese, and served in lettuce cups, they make a quick and substantial dinner. Note: This recipe is part of our series for Serious Eats. We’re as guilty as anyone else of “lazy salad syndrome”. If we can get away with opening a box of pre-rinsed greens and throwing on a dab of supermarket dressing, we’ll do it. As a side salad, that might just about be acceptable. But if we’re making a salad as its own dish – for a quick summer meal, for example – it’s inexcusably lame. But with just a little effort and really no time at all, I can prepare this white bean salad with ingredients I already have in the pantry. Most of the ingredients for this recipe are kitchen staples, and the only things I need fresh are cucumber, tomatoes, feta, and lettuce. The centerpiece of the salad is cannellini beans. They’re the main protein in the dish, and also contribute a lot of dietary fiber. In fact, nutritionally, the beans could be a whole meal by themselves. But even if that weren’t the case, we just love the taste. We use these large white beans all the time in cool-weather dishes such as pasta with broccoli rabe – they have a great texture and hold their shape well, even when sautéed. Their creaminess also works in their favor when pureed for an appetizer dip. These traits make them equally at home in this summer salad. Now, there’s no reason you couldn’t use another variety of canned bean, of course, such as garbanzo, or a red kidney bean, but for our money, the texture of cannellinis creates the best balance here. Don’t forget to rinse and drain the beans well before you use them. We’re pairing the beans with the Mediterranean flavors of briny olives and grape tomatoes, and adding a crunch with chopped cucumbers. The shallots – you could also thinly slice some red onion – are mellowed by the marinade, so while they contribute good flavor, they don’t have too much of that raw oniony bite. Just like when you marinate a meat dish, the beans, too, will benefit from being mixed for a few minutes in the dressing. The standard 3:1 oil:vinegar ratio in a vinaigrette is pushed with a good amount of lemon juice to brighten the flavor of the canned beans. Adding a little mustard helps to emulsify the dressing, as well as adding a good savory kick. Finally, the white bean salad is finished with crumbled feta cheese. You can use whichever variety you prefer – we’ve found that a lot of brands available in supermarkets are either too bland (many domestic fetas are guilty of this) or way too salty (avoid Bulgarian feta for this salad), but if you can get an imported French or Greek version, either should have the balance of creamy texture and ability to crumble over a salad bowl. As well as an at-home dinner, this salad would travel very well for a picnic – there’s no mayonnaise or other ingredients that have to stay chilled – but skip adding the tomatoes and herbs until just before serving, since they would break down too much in the acidic dressing. 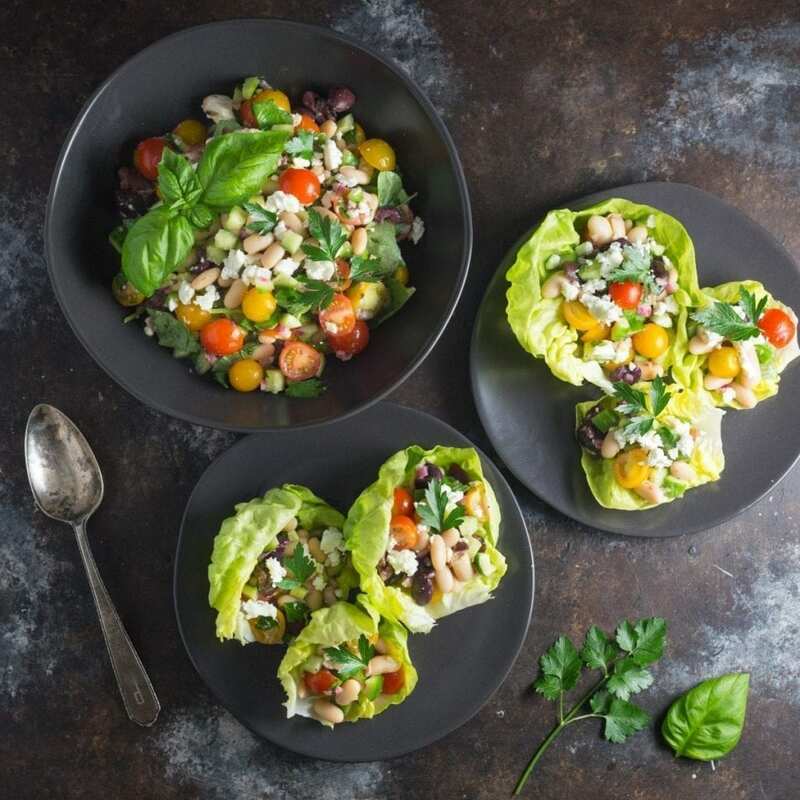 We love using the tight leaves of a head lettuce such as Boston, butter, or Bibb to form serving cups – and if we’re taking this salad out on the road, we don’t even need plates. No clean-up! In a large bowl, add the dressing ingredients together and whisk to combine and emulsify. Taste for seasoning. Add the beans and shallots, and mix well. Let marinate at room temperature for around 10 minutes while you prep the rest of the vegetables. Stir in the tomatoes, cucumber, olives, herbs and cheese. Season with salt and pepper to taste. 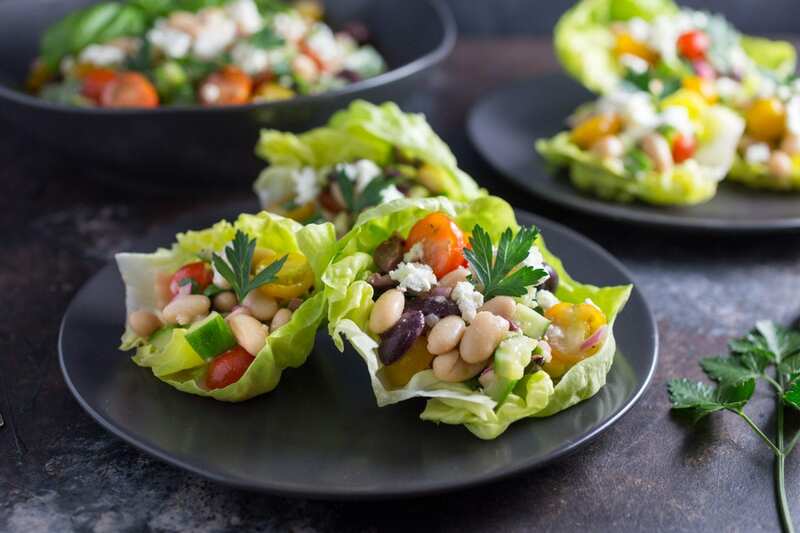 Spoon salad into lettuce cups and serve chilled or room temperature.